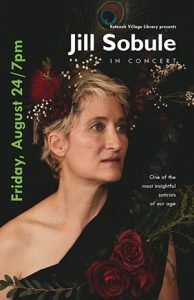 Katonah Village Library presents Jill Sobule in Concert on Friday evening August 24 at 7pm. Jill Sobule is a Denver-born singer, songwriter, storyteller, guitarist, and gypsy. Over seven albums and nearly two decades of recording, Jill has mused on topics such as the death penalty, anorexia, shoplifting, reproduction, adolescence and the Christian right. Jill Sobule’s recording career began in 1990 with her debut album Things Here are Different, recorded by Todd Rundgren. Her 1995 self-titled album, Jill Sobule, yielded the hit songs I Kissed A Girl (the original) and Supermodel. Since then, she has continued to record, produce, and tour with an ever-growing loyal fan base. She’s performed with Neil Young, Billy Bragg, Steve Earle, Cyndi Lauper, Tom Morello, and Warren Zevon, and inducted Neil Diamond into the Songwriter’s Hall of Fame.